Willie Cauley (behind) in helping Free State to a 20-14 win. No one player means more to his team that Strauss. He boosted Lawrence to one of their biggest victories in the last five years when they took down Olathe North on Friday. More importantly, Strauss has returned Lawrence High football to respectability, and then some. And how is this for a stat: the lowest offensive yardage total Strauss has put up this season was his 249 combined rushing and passing yards in week six against SM South. Cauley had his worst game of the season with several miscues, including three dropped passes, coming in the second half of Olathe Northwest's six-point loss against Free State. We'll give him the benefit of the doubt, considering the Raven's normal starting quarterback, Dalton Rook, was injured and wasn't throwing the passes. Guild continues to be the main bright-spot for SM South. His yards per carry average is up to 8.18, and he's running away with the regular season rushing title, sitting 334 yards ahead of the number two rusher in the league. Gentry is due for some love. His efforts certainly haven't been the cause of Olathe North's struggles the past two weeks--in fact, Gentry has amassed 233 receiving yards and three reception touchdowns in that time span, perhaps his most productive two week stretch of the season thus far. McFarland sealed the deal against Olathe Northwest with a four quarter interception against Cauley, a receiver who had seven inches on McFarland. After winning the starting quarterback job following the second week of the season McFarland has produced impressive numbers for Free State (he ranks fourth in the league in passing and fifth in rushing), including helping the team to wins in five of their last six games. 1. An honest rating of the talent level across the Sunflower League this season on a scale of 1-10 with 10 being the best? I would go with a 5. Players like Brad Strauss and Willie Cauley would have been dominant in any season the past 10 years, but overall I've found that it's hard finding the top five talents in the league every week because the consistency just hasn't been there--normally the hard part is deciding who doesn't get on the list each week, but not this season. 2. The most pleasantly surprising players this season have been, in no particular order, Cauley, Gabe Guild, Treshawn Root, Dalton Rook, Kyle McFarland, Remington Whitley, and Jordan Ward. Most of these guys were hardly even on the radar in week one. 3. This could be the first time in, well, decades, that the 6A East representative is not from the Sunflower League. BV Northwest handled Olathe South last week, and they're as hot as any team in Kansas right now. The Huskies most highly touted teams of recent years (2004 and 2005) bowed out early in the playoffs, so we'll see if they buck that trend this time around. 4. Despite having lost two straight games, I still fully expect Olathe North to make a run through the playoffs to the state championship game. Heck, they've made it to at least the Sub-State round in 12 of the last 16 years! 5. 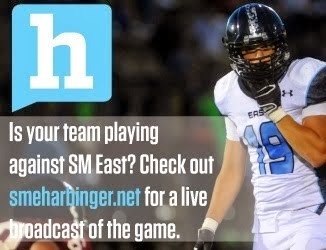 Speaking of the number 12, with their six wins, Olathe East has guaranteed themselves a 12th straight winning season. Jeff Meyers reloads his talent as well as anyone, and that's a fact. 6. Two teams remain in the running for the Sunflower League crown. In odd years league records are based on the first seven SL opponents for each team. Right now, the standings for the two contenders are Olathe South at 6-0 and Olathe East at 5-1. Olathe South has already clinched a share of the title, but Olathe East can get in on a share of the league title if they defeat Olathe South in week nine. League championships don't mean a thing in Kansas, but players do earn a "Sunflower League Champions" patch on their letter jackets (and who's going to complain about that?). 7. The SL may be void of division one offensive lineman this season, but keep an eye out in the next two years. Olathe South sophomore Braden "Gigantor" Smith stands 6-foot-6 and weighs in at around 275 pounds. He benches 380 pounds and he's only 15. He's been a focal point of Olathe South's successes this season and I can only anticipate him getting bigger, stronger, and meaner in the seasons to come. To the north, SM West sophomore Austin Chambers checks in at 6-foot-5 and weighs 290 pounds. He too has been a focal point of his team's success. Often times the main reason lineman don't go division one has to do with their lack of size. Size isn't an issue with either of these kids--and clearly the talent is there or else they wouldn't be starting as sophomores. It also helps that both play (and do very well) in other sports when they're not on the gridiron, which just goes to show their athletic versatility. 8. Two of the more underrated playmakers in the league include SM North's Mason Perez and SM Northwest's Jake Horner. Perez has recorded nine touchdowns this season, and six of those have come on plays of 40 yards or longer. Horner has returned two kicks for touchdowns, not to mention a 45-yard fumble return for a touchdown in week two against SM West that nearly propelled his team to victory. He's also averaging 33.4 yards per return on kickoffs. While neither player is on a stellar team, both are stellar athletes that have a knack for making big plays. 9. Last year the three of the four teams from the Sunflower League who made the the Sectional round of the playoffs led the league in rushing yards per game during the course of the year. This year's top four? Olathe North, Olathe East and SM South at 313, 283, and 277 yards per game, respectively. 10. With McFarland finding his way into this week's Top Five Player Ratings, it poses the great question of whether Free State quarterbacks are simply a product of the system? If you remember back to the glory days of Mike Leach at Texas Tech, literally every year he would have another quarterback who would pass for 4,000 or more yards and 40 or so touchdowns. It didn't matter who the quarterback was, they just all seemed to produce. None of those quarterbacks had success in the NFL and basically their great collegiate stats were attributable to Leach's pass happy system. 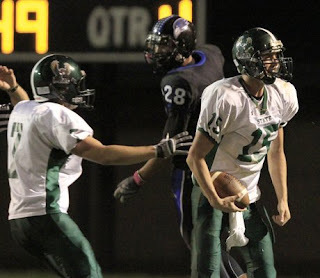 In the SL, Free State has produced three quarterbacks since 2006 who have passed and rushed for over 1,000 yards in a single season, and McFarland could easily become the fourth in a couple weeks. Are the Free State quarterbacks that talented, or has Bob Lisher created a fool-proof offensive system for quarterbacks to produce gaudy yardage in?